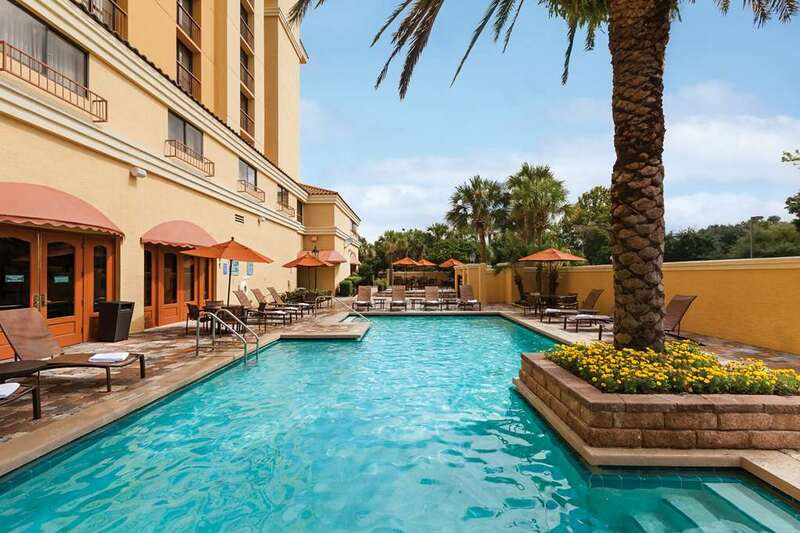 This hotel is 100 PCT non smoking Completely renovated in 2016 Embassy Suites Orlando-International Drive Convention Center is a deluxe all-suite hotel on International Drive surrounded by dining entertainment shopping and a variety of attractions. The hotel is just a half-mile from the Orlando/Orange County Convention Center and just minutes from Orlando*s world-famous theme parks. The multi-million dollar renovation includes completely remodeled guest suites and all public areas. Spacious one-bedroom suites are ideal for families or business travelers alike offering a private bedroom with a King bed two Double beds or two Queen beds. The suites also feature a separate living room with a sofa bed wet bar with refrigerator microwave coffeemaker in-room safes two flat-screen HDTVs and a marble vanity in the bedroom. Suites sleep up to six guests. We provide complimentary cooked-to-order breakfast every morning and a complimentary evening reception* each evening. Hotel amenities include two heated pools one indoor and one outdoor whirlpools and a children*s splash pool. The hotel also offers a poolside full-service restaurant and bar room service complimentary business center fitness room and on-site car rental. The hotel is a Walt Disney World Good Neighbor Hotel with tickets available online and through the Concierge Desk. We provide complimentary scheduled transportation to Walt Disney World Universal Orlando and SeaWorld theme parks. The I-Ride Trolley stops directly in front of the hotel for convenient transportation to the many International Drive attractions and outlet malls. The hotel has modern designed meeting and event space accommodating meetings and social events for up to 450 guests. *Service of alcohol subject to state and local laws. Must be of legal drinking age. In Suite Dining: Sometimes International Drive has to many choices. Enjoy a fantastic meal right in the comfort of your suite. We*ll happily bring one of our mouth watering burgers a hot steaming bowl of pasta fresh fish or a fantastic fresh salad. Don*t forget your favorite beverages are available thru room service too. Bahama Breeze: Casual Caribbean dining and bar with outdoor fire-pit and live entertainment. Located across the street from the hotel. Maggianos: Famous family style Italian bistro. Tommy Bahama Cafe: Tropical Carribean lunch - dinner. Seasons 52: Casual upscale health-conscious dining. The Capital Grille: Upscale steak - seafood. Bob Carr Performing Arts Ctr.